Swelling the Blackberry Curve's already formidable arsenal of telephonic and connectivity tools, the red Blackberry 8310 Curve now adds an internal GPS receiver with support for TeleNav GPS Navigator software and push-to-talk (PTT) capability--an AT&T exclusive. An amalgam of the svelte BlackBerry Pearl and the more business-oriented 8800, the 8310 Curve is the smallest, lightest BlackBerry phone that includes a full QWERTY keyboard. And it combines RIM's long-valued push email and messaging platform with a host of advanced multimedia features, including a 2-megapixel camera and stereo Bluetooth (for listening to music via wireless headphones). This quadband phone operates on GSM 850/900/1800/1900 networks and can handle high-speed data connectivity via AT&T's EDGE network, with availability in more than 13,000 US cities and along some 40,000 miles of major highways. It also offers global voice roaming in over 190 and data roaming in over 130 countries. 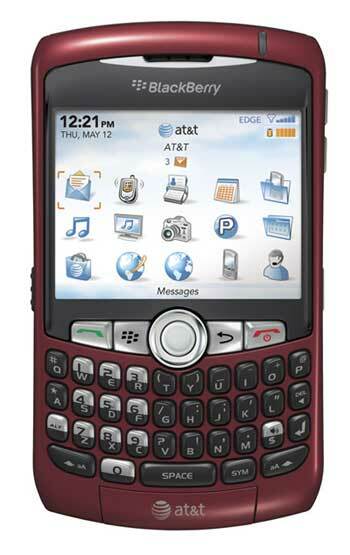 The svelte BlackBerry 8310 Curve in red (an AT&T exclusive) offers a full QWERTY keyboard, innovative trackball navigation system (placed above the keyboard) and large 2.5-inch screen. The Blackberry 8310 Curve delivers the legendary BlackBerry email experience. With BlackBerry service plans from AT&T, you can receive emails instantaneously from up to 10 email accounts (personal and enterprise). With BlackBerry push technology, you don't need to retrieve your email. BlackBerry devices are designed to remain on and continuously connected to the wireless network, allowing you to be discreetly notified as new email arrives. Support is also built-in for viewing email attachments (Word, Excel, PowerPoint, WordPerfect, and PDF formats). If your company has a BlackBerry Enterprise Server installed, you can also take advantage of the power of wireless calendar synchronization. Your calendar events are exchanged wirelessly and automatically so that your desktop calendar and BlackBerry handheld calendar are synchronized. All your Outlook meeting requests, changes, and updates are instantaneously synchronized instantaneously with your desktop. Make meeting requests, invite new attendees and more, all on your Blackberry 8310 Curve. Users without BlackBerry Enterprise Server support can manually sync with their desktop calendars and contacts via Bluetooth or USB using the included BlackBerry Desktop Software. BlackBerry Internet Service (BIS) is complimentary with the activation of a AT&T BlackBerry service plan (additional charges apply) and provides customers with the ability to have their personal or work email pushed automatically to their BlackBerry phone from multiple Internet Service Provider (ISP) email accounts. BIS provides automatic wireless synchronization of read, deleted, and sent email from the your BlackBerry phone to their desktop email account. Users with multiple accounts can choose from multiple "sent from" addresses when sending an email. You can also download ringtones and other content via AT&T's popular MEdia Net service or browse the Web using the BlackBerry HTML Browser. Wireless text messaging and multimedia messaging (MMS) are also supported by the BlackBerry 8820. Among the unique features of the Blackberry 8310 Curve are AT&T's Push-to-Talk (PTT) service and TeleNav GPS Navigator. AT&T Push-to-Talk boasts the largest push to talk coverage area in America. PTT features on the BlackBerry 8820 include "availability" icons, quick group calling, and the ability to easily convert a PTT session to a regular wireless voice call. You can use your 8310 Curve to Push-to-Talk to communicate with individual colleagues or friends, or set up groups for broader communication. The PTT button, on the left side of the device (noted by three raised dots), easily facilitates each PTT call (simply press and hold to talk after the chirp and release when finished). In addition, the AT&T service offers such standard PTT features as call waiting, contact alerts, as well as text, picture, and voice messaging to anyone in their contact list. You can also take advantage of the TeleNav GPS Navigator software, the full-featured premium navigation application that includes audible turn-by-turn directions, real-time traffic updates and re-routing options, and 3D moving maps. It comes as a 30-day trial version, and it can be downloaded via the TeleNav web site or via virtual pre-load icon (VPL) after activation. This 8310 Curve is fashioned in a red finish and subtly curving corners. Measuring 4.2 x 2.4 inches, the Curve is just as slim as the Pearl (0.6 inches) and weighs in at 3.9 ounces--just 0.7 ounces heavier than its predecessor. It features a bright 2.5-inch color TFT screen that provides 65,000 colors and a 320 x 240-pixel resolution, and it includes a light-sensing feature that automatically adjusts backlighting for indoor, outdoor and dark environments. Like the BlackBerry 8800, the Curve includes a trackball navigation system located on the top of the QWERTY keypad, and it also features an integrated spell checker with a customizable dictionary to help maintain accuracy while on the go. It has 64 MB of internal ROM memory, and is expandable using MicroSD memory cards. The battery provides up to 4 hours (240 minutes) of talk time and up to 17 days (408 hours) of standby time. You can snap vivid photos (though no video) using the 2-megapixel camera on the back of the Curve, which also features a 5x digital zoom, built-in flash, self-portrait mirror and full screen viewfinder. It can capture images in up to three picture quality and size resolutions that can be shared instantly by email, MMS or BlackBerry Messenger, or even uploaded to your Flickr account with the Yahoo! Go service. Photos can also be immediately set as a unique caller ID or Home Screen image. You can edit photos and create albums within the Curve using the PhotoSuite application. Pictures can be cropped, rotated and straightened, and flaws can be fixed by removing redeye or changing the brightness, contrast, and saturation levels. Listen to your favorite music and watch downloaded videos using the included stereo headset, or use an optional wireless headphone thanks to the Curve's support for the Bluetooth stereo audio profile (A2DP/AVRCP). The Curve is compatible with a wide variety of file formats, including MP3, WMA and AAC/AAC+/eAAC+ audio and WMV, MPEG4 and H.263 video. Dedicated volume controls are conveniently located on the side of the handset. You can also subscribe to the AT&T Music service, which includes access to online subscription music content from eMusic, XM Satellite Radio and more. With the Voice-Activated Dialing (VAD) feature, you can initiate a call just by telling the Curve who to call from your contact list--either via the integrated speakerphone or using an optional Bluetooth wireless headset. Other advanced phone features include advanced sound technology that cancels out background noise and echo, dedicated volume and mute keys, and the ability to customize the Curve with polyphonic and MP3 ringtones. The BlackBerry 8310 Curve weighs 3.9 ounces and measures 4.2 x 2.4 x 0.6 inches. 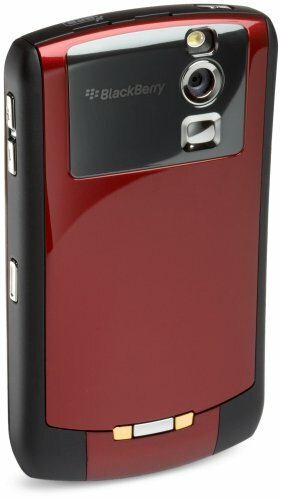 Its 1100 mAh lithium-ion battery is rated at up to 4 hours of talk time, and up to 408 hours (17 days) of digital standby time. It runs on the 850/900/1800/1900 GSM/GPRS/EDGE frequencies. It takes great pictures, is very user freindly, and will always be my phone of choice. After working with this phone for a few days, it's the best thing since sliced bread. I've had this phone about 6 months and for the most part I really like it. Good sound quality including the speaker phone. I like being able to pickup my email when I'm away from home. Charges much faster than my previous phones and seems to hold a charge for quite a while. I like that I can sync it with Outlook but it requires some tweaking to get what you want. Tech support is pretty good but you need to call the 800 number because the sales people don't seem to really know much about it. In fact one sales rep gave me bad info and I lost some pictures. The keyboard is really small so it's not the easiest to type messages. I had to get a replacement after 3 months because the roller stopped working. On occasion the phone won't make a call; the solution seems to be that you need to take out the battery. When you put the battery back in it seems to be fine. I got this so I wouldn't have to carry a cell phone and my Palm Pilot. Entering and viewing appointments is just average, my Palm was much better. Set the scene and then I can base the critism on my user profile. Note, this review is about the phone and not the service. I get 200-250 e-mails a day and in 4-8 meetings a day. I am 35 years old. I spend 10-12 hrs a working day around a computer. I just used a small laptop for my organiser and e-mail. I have never used a PDA. Blackberry seems an obvious choice to make me more productive? -Many people around me had PDAs either iPhone or Blackberry. I felt I was being left behind. -It's cool for my friends to see me with one?! It was easy to link to my Outlook exchange server and get e-mails. But the goodness stops there. It may be easy to put gas/petrol in the car but if the car is slow, incredibly difficult to steer and drive, what's the point of having easy filling? -It crashes once a day. -The keys are so rediculously small that writing text fast will not happen. You hit multiple and wrong keys. You often need the delete key and it is burried at the bottom under your thumb. Someone needs to think about usability! -Usability is appauling!!! I expect to invest some time in learning new technology but the whole thing has been designed without a primary audience. I want a Blackberry to phone, see my calendar and read and answer short e-mails. I have an iPod for music. When you want to dial a number you have to use the 9 '2' font keys on the screen. Doing this with one hand is painful. The numbers are also on the left hand side. Most of use will use our right thumb! -The Noises!!!! The defaults drove me crazy!! 200 e-mails a day. I could have danced to the music the phone made. Every e-mail, every calendar invite the things buzzed beeped and chirped! It was killing the battery. I just needed to know if a phone call was coming in. The fun part was then turning the bleeps off! Read on for an example of crazy usability. It took me about 15 minutes to find out how to do an obvious function. 2) Click using the roller- ball. This opens the drop down menu with 4 big items, normal, vibrate, Quiet and Loud. You would think you then use that 'left click' button to edit. Wrong. 4)Observe a new list of profiles which you just saw in just a smaller menu this time!!! 5)Navigate to the profil you wish to edit- say 'Loud'. Now click with the roller ball. 7) Select the functionality you wish to change the noise on, say 'Messenger- New Message'. Who named it 'messenger'!!! 9) Click 'Out of Holster' using the roller ball, None, vibrate, Tone or vibrate plus tone. 10) Select an option by clicking with the roller ball. 12) Use the navigate back button to force a save. Save dialogue then pops up. 13) Select the save or discard button using roller ball. 14) Now go back to step 7 and repeat to 14 another 11 times for the other default beep and tune settings for the default 'Loud' profile!!! -The e-mail text you get back has lost all formatting so often you loose context and it is impossible to read. -The synchronization software using default installs on XP was slowing my machine start-up by 2 minutes, locking all access to the machine! It was the first thing I uninstalled. Like most tech-savvy professionals, I use and rely on a BlackBerry at work. In fact, I've been an addict for quite some time. I recently updated from an 8700 to this amazing phone. The email, calendar and address book are all what you expect and are accustomed to from BlackBerry. There are a ton of great improvements and I've outlined my likes and dislikes below. * The screen appears to be the same 320x240 screen that is found on the older 8700. It's outstanding and flat out huge. There are various levels of backlighting and there is a handy auto-DIM feature that adjusts the backlight according to room lighting conditions. * The rollerball took a little getting used to, but after less than a day, I'm an expert. OK, not quite an expert, but I dialed in the sensitivity to suit my needs. I also turned off that annoying clicking sound. I guess that was supposed to simulate the audible "click" you would get from the old wheel. * The keyboard is perfect. I was really scared about going to something new but the spacing and texture are dead-on. Typing is a breeze. * Spell-Check; a warm welcome to something that has been missing for a LONG time. It's also super-easy to use. I get a prompt right before I send an email asking me to approve typos. Great job BlackBerry! * The multimedia software is excellent; both on the device and on the desktop. You can watch movies, listen to MP3s and check out your photos on the handset. The Music software is not as good as what's on the Sony Walkman w580i phone, but it gets the job done. The Roxio-powered Media Manager software for the desktop offers super-easy drag and drop of MP3s and movies. It even converts files on the fly so they work with the Curve. This is one of the best additions to BlackBerry. The easy to use interface really turns this into a multimedia device. * The camera is pretty good too. The LED flash is very bright and allows for a decent photo in low light. Full Screen view finder is a nice plus. There is even a little mirror on the back for self portraits. * 3.5mm Stereo/Audio Jack is built-in. No adapter needed. Amen BlackBerry! Just plug my Shure buds in and I'm in audio bliss. * Real GPS! This is awesome. I've just started to tinker with the TeleNav software. I don't like the fact there is a monthly fee, but the turn-by-turn directions rival standalone navigation systems I've used. It's awesome but pricey. I'll start hunting for alternative navigation software. * Monthly fees associated with true turn-by-turn navigation software. The GPS does work great with BlackBerry Maps and Google Maps for location. Not quite the same as Telenav. * Memory card is located under the battery. I find it very annoying that I have to power down the phone to remove and replace the card. Hey, at least it's MicroSD. * It's a fingerprint magnet. Not iPod bad, but visible enough that I keep wiping down the body. * No playlist support for the music software. All in, this is the best BlackBerry I've ever owned. Highly recommended. Not for ppl who want "just a phone"
Get this if you're going to get the Blackberry plan and if you're going to use EVERYTHING this phone offers AND MORE. Get this if you're planning on upgrading the OS and if you're not scared of a bit of technology. DON'T get this if you're just looking for a pretty phone that won't be used for more than taking pictures, making calls/SMS/MMS, and checking e-mails and you don't ever want to even think of upgrading the OS or using the phone to its full potential. My only qualm is that I can't charge my 8310 on just any mini-USB. It only charges on its own charger. I have the Blackberry Curve in Red. I love it. I have a pearl as well, but I like the Curve Better. BUY THIS PHONE YOU WON'T REGET IT... just from who you buy it from. I purchased my Blackberry (first Blackberry ever) about six months ago. All in all, I would NEVER go back to a regular phone. Yes, the Curve has its quirks, but I'm extremely happy with my phone. -Big, beautiful screen. I download unique backgrounds from [...] and bam, I have a cool picture to greet me when I use my phone. -Different themes. Personally, I like the BB Dimension Zen, which is uncluttered and lets me choose from my top five applications. -3.5mm headphone jack. I added a 8gb MicroSD card to the phone and it's made my Sansa MP3 player obsolete. -Calendar and Tasks. As a college student who works part-time, I have a ton of times and appointments to keep track of. Entering information and reminders is super easy. -Email. Coming from a regular flip-phone where I used 200 text messages a month, using email on a phone has been like a mini-miracle! -Profiles. Someone mentioned that setting Profiles was a nightmare, and I agree that it can be somewhat tedious, but I find it to be worth it. I ended up creating profiles of my own (like "In the car" or "Class") and I personally appreciate that I can choose my notification for every possible event on my phone, whether it be an SMS text, a call, or an email. -Keyboard. I was hesitant about buying the Curve because of the keyboard. I have pretty big fingers, not very nimble, but I had no issues with the keyboard. The spacing and size are perfect, and it's all very easy to get used to. -Size. The size of the phone fits in my hand very nicely. I got a silicone case for it so it doesn't slip. -The MicroSD slot. It's behind the battery. Which means powering down the phone, removing the battery, putting in the card, putting the battery back in, and starting up, which can take a few minutes. This is my biggest gripe about the phone. -The rollerball. It can get grimy and hard to use, but as long as it's cleaned every once in a while, there's no problems. I've bought at least 200 items from Amazon and I've never once written a review. With the Blackberry Curve 8310, I can't resist writing one. My husband has an original Blackberry from about 4 years ago. I've used it a few times, mainly on trips, but I didn't think it was particularly intuitive. I never felt comfortable with the features or buttons. I have 6 kids and a very full calendar. I am constantly finding myself making follow-up dentist/doctor/hair appointments and having to call to reschedule once I reconcile the appointment card with my calendar (this happens whether I am using a paper calendar or my Outlook calendar). I am often out and about and need a phone number. Late for picking up the kids at preschool? I'm out of luck if I don't have the school number and/or the number of a parent of another preschooler to pick my child up. I'm the room parent for another child's classroom. I often run into parents who ask me what they signed up to bring for the next classroom event. Easy enough with the new Blackberry. Having had several blackberries with other carriers, I expected this setup to be easy -- AT&T is an unmitigated disaster. First, the phone was shipped with a SIM card but NO sim card installation instructions and no where to find it in an easy fashion on their poor website...oh and don't try tech chat -- it's closed when it's supposed to be open. I never had these problems with other carriers -- once I figured out the SIM thing, I loaded personal email accounts just like I had previously -- except it won't work -- and guess what -- no possible help from AT&T. Before this i had a treo 700p from alltel. i have to admit, for the first couple of days i had a tough time with the blackberry-- the layout of the curve seemed less intuitive and i found myself missing the touch screen of the treo. however, after the initial learning curve and getting used to the roller ball, i love the blackberry and i'm not sure i could go back. for me the biggest advantage is that the blackberry is a about HALF (maybe a third) of the size/weight of the treo (which was like a brick in my pocket) and i love the fact that blackberry pushes my email through immediately. incoming sound quality is indistinguishable between the two phones. from all feedback that i've received, outgoing sound quality is significantly better on the blackberry.